Reading this book transports you to a different world! 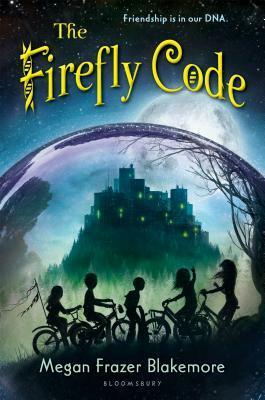 The Firefly Code was written by Megan Frazer Blakemore and published by Bloomsbury in in 2016. This story explores interesting ethical ideas, but even if you don't want to think about it on that level, it’s a great read with a little bit of mystery, problems with friends and some surprising events along the way. I really enjoyed the friendships between the characters. The ending was a bit abrupt so I was glad to see from the author's website that a sequel is coming. I would gladly spend more time with the 'Firefly Five' on their adventure. You will appreciate the lovely, poetic way that Megan Frazer Blakemore uses words to create sensory images. Even though it moved along at a good pace and had an intriguing storyline, care was taken to choose just the right words, without overburdening the story with description. I really love the writing style! There are so many interesting sparks for discussion in this story! The whole idea of a utopian community is fascinating (and would make for an interest project for students to work on as a group). There are also some interesting lesson plans related to building community on Megan Frazer Blakemore’s website). You could talk about artificial intelligence, genetic engineering, environmental issues, politics and ideas about safety, friendship, diversity, community – there’s really a lot to think about here. This would be interesting as a classroom read aloud. Megan Frazer Blakemore is the author of several middle grade novels, including The Water Castle, The Friendship Riddle, and The Spy Catchers of Maple Hill. THE DAYBREAK BOND, Book #2 in The Firefly Code series is scheduled for release in September 2017. Check out this video on how she comes up with her ideas. This is a cute story that encourages creative thinking and dramatic play! 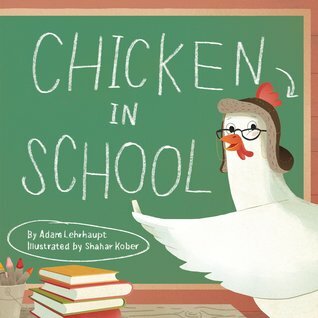 Chicken in School was written by Adam Lehrhaupt and illustrated by Shahar Kober. It was published in 2017 by Harper. “Zoey wasn’t like the other chickens. The concept of this story is very appropriate for young children. They will easily connect with the idea of “playing school.” I liked the gentle humor the author created through the secondary characters and their reactions to the main character’s over-the-top ideas. It’s fun to see how the illustrator has enhanced the humor in the text. The expressions on the character’s faces reveal a lot about what they are thinking! This book is a nice choice to support play-based learning in a preschool or kindergarten classroom. I especially loved Zoey’s creative way to use books and crayons! This story also promotes a positive attitude towards school. Look at the pictures Zoey drew of her adventures. What would your adventure be? Draw a picture to show what you would do. What other things could you build with besides books? Draw a plan to show what you would build and ask if you can try it out! Build your own school. What do you need? What would you want to learn? If you like books about animals, you'll love all the details about the zoo and the wildlife rehabilitation centre! How to Outfox Your Friends When You Don’t Have a Clue was written by Jess Keating and published by Sourcebooks Jabberwocky in 2015. It’s easy to relate to the main character, Ana, and her friendship problems and I really wanted to find out how she would solve them! People do change and it can be hard, sometimes, to let go of the way you thought they were before. The story moves along at a good pace, and is full of cool details about animals and what it’s like in the zoo as well as a wildlife rehabilitation centre. I also enjoyed the humor in the story and Ana’s animal-related perspective on the world! This is a great novel to check out if you need an example of an excellent voice. Everything is from the perspective of the main character, including her views on animals, friendships, homework and family issues, like her annoying twin brother. The dialogue is realistic and so are the problems Ana faces. This would be a fun book to have in a classroom collection or school library. There are some important issues about friendships that arise in this story. I especially like how, in this series, the main character Ana has become friends with a girl she thought was her enemy. It’s also nice to see Ana’s mature attitude about the idea of “best friends” that emerges in this novel. I really liked the school assignment she had to do about finding five important influences in her life – it would be an interesting assignment to do with students. Jess Keating is the author of several other middle grade books, including How to Outrun a Crocodile When Your Shoes are Untied (see my review here) and How to Outswim a Shark Without a Snorkel. You might want to check out Jess Keating’s kids magazine, The Curious Creative. What a lovely book for a classroom collection! It celebrates diversity through the different activities mentioned in the text and through the different styles of illustration on each double-page spread. Simple text describes the ample space available to our children in this country, and the freedom they have to grow and dream and share. With artwork from 13 of Canada’s finest illustrators, each page is a celebration and a reminder of the infinite variety of our home and native land. Heather Patterson’s free verse poem I Am Canada, originally published in 1996, gets new life in this beautiful, illustrated hardcover timed to celebrate both Canada’s 150th year and Scholastic Canada’s 60th anniversary. 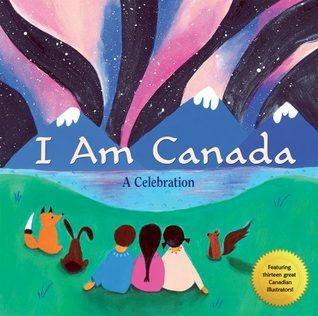 I Am Canada: A Celebration was published in 2017. In a lovely, child-friendly way, this book shows the space and freedoms of living in Canada, from “I have space” to “I stay out late and see the northern lights.” I especially enjoyed the way it celebrates diversity through the different activities mentioned in the text, as well as through the diversity of illustrators who created work for this project. It’s a good book to explore if you’re thinking about how to create a meaningful and expressive text using minimal words. If you’re an illustrator, this book will be very interesting to investigate, since it showcases 13 different illustration styles. It was also fun to look through the book to see if I could tell who the illustrator was for each spread (they are listed at the back). I enjoyed reading the notes at the back, describing the inspirations for creating the work from the author and each illustrator. I think this is an important book to read aloud with students. Almost every page provides an opportunity for young children to share a bit about themselves and will lead to discussion about similarities, differences and what it means to be part of a community and culture. I hope to find it in my school library—and it’s on my wish list of books to purchase for my classroom. What is your favourite page in the book? Why? Work with your classmates to create your own “I Am Canada” book. What will you create on your page? What is important to you about being Canadian?